Doxycycline belongs to the group of tetracyclines and acts bacteriostatic against many Gram-positive and Gram-negative bacteria, like Bordetella, Campylobacter, E. coli, Haemophilus, Pasteurella, Salmonella, Staphylococcus and Streptococcus spp. Doxycycline is also active against Chlamydia, Mycoplasma and Rickettsia spp. The action of doxycycline is based on inhibition of bacterial protein synthesis. Doxycycline has good affinity towards the lungs and is therefore especially useful for treatment of bacterial respiratory infections. Gentamicin sulphate belongs to the group of aminoglycosides and acts bactericidal against mainly Gram-negative bacteria, like E. coli, Klebsiella, Pasteurella and Salmonella spp. The bactericidal action is based on inhibition of bacterial protein synthesis as well. 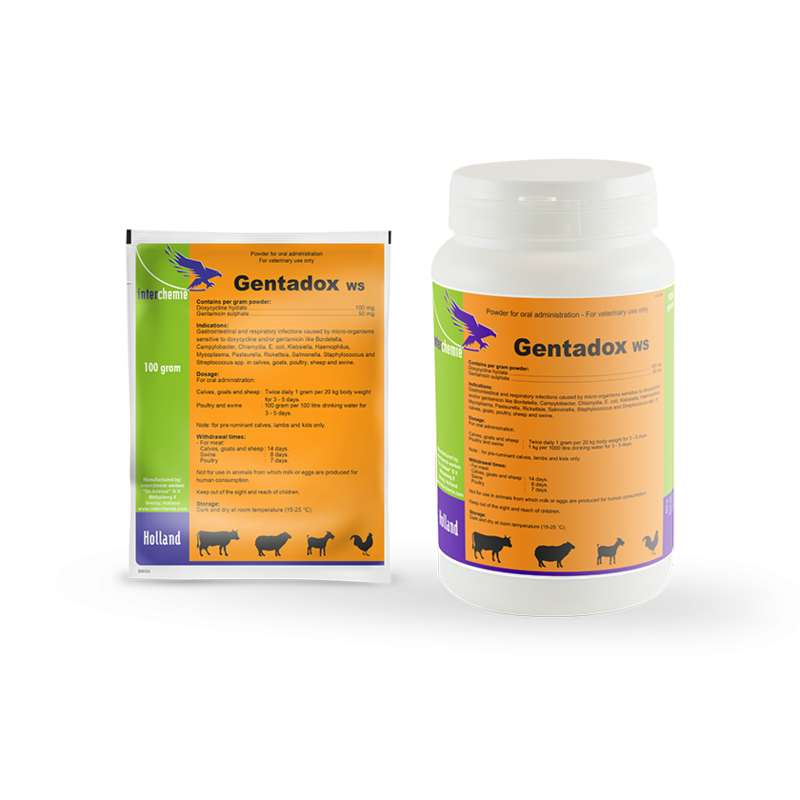 Administered orally, gentamicin is poorly resorbed and, therefore, performs its action predominantly in the gastrointestinal tract. Gastrointestinal and respiratory infections caused by micro-organisms sensitive to doxycycline and/or gentamicin, like Bordetella, Campylobacter, Chlamydia, E. coli, Klebsiella, Haemophilus, Mycoplasma, Pasteurella, Rickettsia, Salmonella, Staphylococcus and Streptococcus spp. in calves, goats, poultry, sheep and swine. Administration to animals with seriously impaired renal or hepatic functions. Prolonged application of high doses may result in neurotoxicity, ototoxicity or nephrotoxicity. Twice daily 1 g per 20 kg body weight for 3 - 5 days.